This article will detail the process of exporting a Report from the CRM to Excel. Using the Report Builder will allow you to create endless custom Reports to extract the data you need from the CRM. Whilst the Report Builder provides you with access to powerful reporting capabilities with just a few clicks, there are times where you may need to get a hold of this data in Excel. 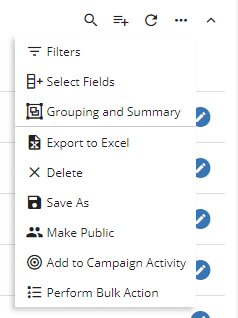 Please note in order to export a Report to excel you will require the CRM Print Lists responsibility within the CRM, if you find you do not have these, please contact your CRM administrator. The first step is to open your saved Report. If you are creating a new Report, make sure you hit save before trying to export. Once open, click the Menu "..." button to the top right of the screen. This will generate an Excel spreadsheet and download this onto your machine.